The ISBN (International Standard Book Number) system is utilized to automate ordering and inventory systems for book publishers, distributors and retailers. It is also utilized for the monitoring of sales data in the publishing industry. This tutorial will guide you step-by-step through the process of creating an ISBN barcode for a book. The ISBN code created in this tutorial is also identical to the EAN “Bookland” barcode. Before making an ISBN barcode, the user must first apply for an ISBN number. This number should be 10 or 13 digits, for example 0-9767736-6-X or 978-0-9767736-6-5. Once the ISBN number is obtained, it should be displayed above the barcode on the book. All books published after January 1, 2007 must display the number in the new 13-digit format, which is referred to as ISBN-13. Older 10 digit numbers may be converted to 13 digits with the free ISBN conversion tool. The last digit of the ISBN number is always a MOD 11 checksum character, represented as numbers 0 through 10. When the check character is equal to 10, the Roman numeral X is used to keep the same amount of digits in the number. Therefore, the ISBN of 0-9767736-6-X is actually 0-9767736-6 with a check digit of 10. The ISBN check digit is never encoded in the barcode. To make an ISBN barcode as required by the ISBN, products are needed to generate an EAN13 barcode and the OCR-A representation of the ISBN number, which appears above the EAN13 barcode. 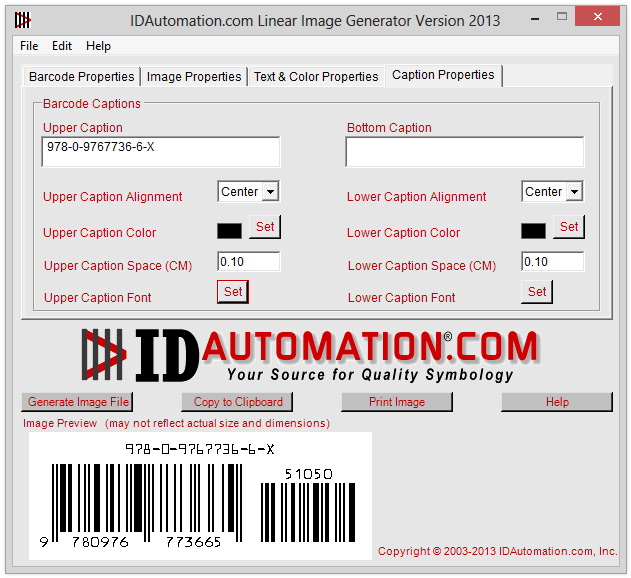 In this tutorial, the Barcode Image Generator and OCR Font Package are used to create the barcode and can be purchased together in a specially priced ISBN Barcode Package. In some cases, it may be more desirable to create ISBN barcodes with IDAutomation’s UPC/EAN Font Package. If dynamic barcodes or additional automation is necessary, IDAutomation offers many barcode font tools, components and stand-alone applications for this purpose. When printing multiple ISBN labels that are applied to an existing book, IDAutomation’s Barcode Label Software may be the best product to use. The complete 13-digit ISBN number is to be displayed on the book, above the ISBN barcode, in the IDAutomationOCRa font, which is part of the OCR Font Package. The ISBN-13 barcode that appears below the ISBN number is created by encoding an EAN13 barcode type directly with the first 12 digits of the ISBN-13 number as shown in Fig 1. The ISBN-10 barcode is formed by appending the first 9 digits of the ISBN number to 978*. For example, an ISBN number of 0-9767736-6-X would be encoded in EAN-13 as 978097677366. After agencies run out of numbers allocated to the 978 prefix, they will begin using EAN13 barcodes preceded by 979. When the ISBN number is encoded in the EAN-13 barcode, it is often called a Bookland barcode. A Supplemental 5-digit add-on barcode is optional and can contain the price of the book or periodical. The price is encoded by appending a 4-digit number to the currency number – use 0 for the British Pound and 5 for the U.S. Dollar. For example, if the book sells for 10.50 in USD, encode 51050 in the 5-digit add-on. A supplemental code of 90000 indicates that the book has no suggested retail price. Supplemental numbers in the range 90001 to 98999 may be used by publishers for internal purposes. Complimentary copies of books are marked 99991. The National Association of College Stores uses 99990 to mark used books. Fig 1. Encoding ISBN-10 and ISBN-13 numbers in the EAN-13 barcode. * The last digit of the ISBN number is always a check digit and is never encoded in the barcode. After encoding the 12 digit number (13 digit ISBN minus the check digit) in the EAN-13 barcode, a new EAN13 check digit is generated for the barcode symbol only. Install the OCR Font Package. After the OCR fonts are installed, install the Barcode Image Generator. Open the Image Generator. In the Barcode Properties tab, enter the first 12 digits of the ISBN number and the number 5 plus the price of the book. The last digit of the ISBN number is a check digit; which is not encoded in the barcode. Choose 1.80 for the Bar Height and .050 for the X dimension. Choose EAN13 for the Symbology. 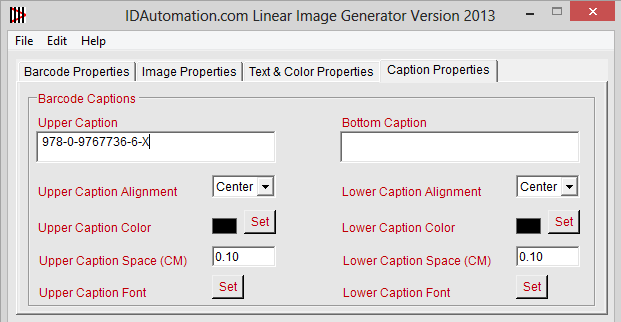 In the Upper Caption text box on the Caption Properties tab, enter the assigned ISBN number (with dashes) preceded with the text “ISBN”. While this tutorial implements a 10-digit ISBN number, all books published after January 1, 2007 should display the ISBN in the new 13 digit format. Existing 10-digit numbers may be converted with the Free ISBN Conversion Tool. When using a 13-digit number, the upper caption would be ISBN 978-0-9767736-6-5. 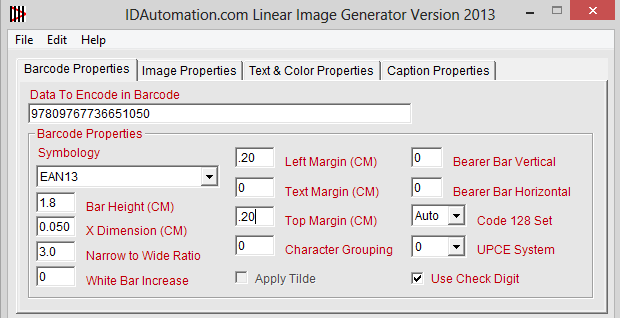 Choose Generate Image File and save the image to the hard drive. This image is now ready to be imported and placed in the book’s graphics or printed as a label. If it is desired to create multiple ISBN labels, this same process may be used with IDAutomation’s Barcode Label Software. When the EAN-13 barcode of the ISBN is read, the data scanned should equal the numbers printed below the barcode on the book. For example, the barcode generated in Fig 1 would scan as 9780976773665. A common method of reading and testing barcodes is with a hand-held barcode scanner. Most of the barcode scanners recommended by IDAutomation perform keyboard emulation and receive power from the USB port, so that no external power supply is required. When a barcode is scanned using keyboard emulation, the data read appears at the cursor as if it had been typed in from the keyboard. Most barcode scanners have the ability to read ISBN and Bookland barcodes by default, such as the hand-held IDAutomation USB Barcode Scanner.